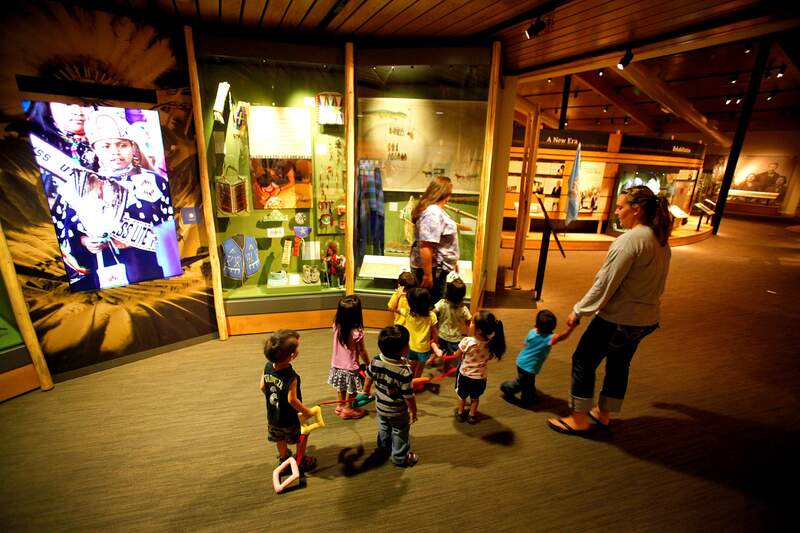 Two- and 3-year-old children from the Southern Ute Montessori Early Head Start program tour the Southern Ute Cultural Center and Museum in July 2012. On Tuesday, tribal elders expressed concerns about the museum’s artifacts during a Southern Ute Tribal Council meeting. The Tribal Council took over management of the museum after it failed to become self-sustaining. Southern Ute tribal members had many questions but received few answers at a Tuesday meeting called to discuss the fate of the Southern Ute Cultural Center and Museum. About 25 attended the gathering at the SunUte Community Center in Ignacio, where elders expressed grave concerns about what will become of the artifacts within the museum, which opened at its present location in 2011. Last month, the Southern Ute Tribal Council announced a management takeover following the dissolution of the museum’s nonprofit status, reasoning that the museum board did not meet its goal of becoming financially self-sustaining in five years. Tribal Council members Tyson Thompson and Amy Barry, the tribal liaison on the museum board, said the governing body cannot divulge further details about museum operations or collections until the transition is complete. “Part of the agreement is to conduct an inventory of the collections – figure out what is on loan, what is purchased,” Barry said. She added that the museum’s management will be addressed in a later phase; for now, what to do with the artifacts is the tribe’s primary focus. Attending tribal members criticized the Tribal Council for a lack of transparency. In previous interviews with The Durango Herald, museum staff and board members have said the lack of tribal members on staff has ruffled feathers with the council and led to the current discord concerning the museum. When the museum loses nonprofit designation, collections must be given back or renegotiated with the donors. The council has appointed Linda Baker, a tribal member, to handle inventory and lead the museum through the transition. Baker did not attend Tuesday’s meeting, but Remington said he met recently with her, and some donors have reclaimed their artifacts.